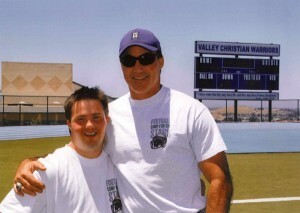 Football Camp for the Stars | For Athletes with Down Syndrome who love football. Our athletes are in the middle of the action, resulting in an authentic football experience. The Football Camp for the Stars, believed to be the first of its kind in the United States, is the brainchild of current Valley Christian Schools (VCS) Varsity Football Coach, Mike Machado. The mission of the camp is to provide athletes with Down Syndrome an authentic football experience while maintaining the highest standards of safety. The first camp was held in June of 2007.